Now is also a great time to address any drainage problems you might have before the big thunderstorms come in the spring. If you have trouble with water standing on your Driveway, Sidewalk, or in your yard, we can quickly diagnose your Drainage Problems and Design a specific Drainage System to fit your needs. 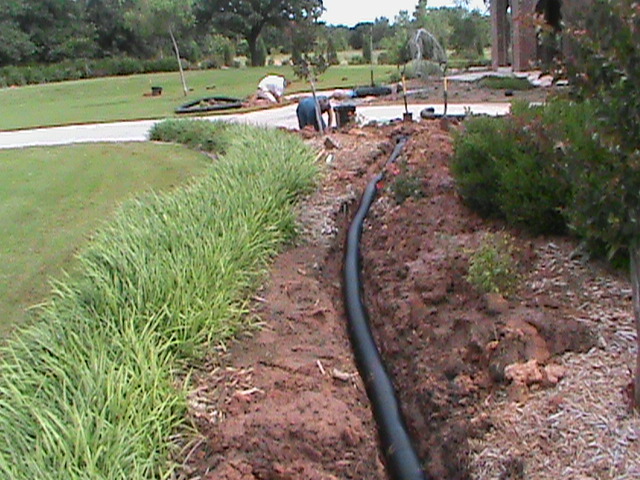 CMG utilizes: French Drains, Surface Drains, Channel Drains, Basin Drains, Trench Drains, Basement Drains, and Sump Pumps. CMG Sprinklers and Drains services Central Oklahoma including: Oklahoma City, Moore, Norman, Midwest City, Del City, Edmond, Mustang, Yukon, Purcell, Blanchard, and Newcastle and all surrounding areas. If you live in Central Oklahoma and are considering a new lawn sprinkler system, CMG can do the job! We have been installing Lawn Sprinkler Systems since 1993. During that time we have installed Sprinkler Systems all over the state and even in Texas. We take great pride in the work we have done so far and are looking forward to doing work for you! For folks that already have a sprinkler systems, we specialize inExpert Sprinkler Repair. If your sprinkler system needs a major overhaul or just a minor adjustment, CMG Sprinklers and Drains is ready to help! If you are considering a New Sprinkler System or already have an Irrigation System, you should consider a RAIN/FREEZE SENSOR. It automatically turns off your sprinkler system when you are away or are unable to turn off the sprinkler system. If at any time it is raining or snowing and nobody remembered to turn off the sprinkler system, the Rain/Freeze Sensor will do the job. If you are gone on vacation the Rain/Freeze Sensor will turn the sprinkler system back on again when it is dry enough to water again. Pretty Cool! Many times, businesses leave their Sprinkler Systems turned on. I have many times repaired sprinkler systems that were allowed to run during snow storms. Spring is just around the corner. If you have drainage problems after thunder storms CMG can help. If your sidewalk turns into a moat after a storm or if you back yard looks like a pond and water is left standing, give CMG a call. We design complete drainage systems which may utilize, French Drains, Surface Drains, Channel Drains, Basement Drains, Trench Drains, Basin Drains, or Sump Pumps depending on your needs. CMG can help you protect and maintain your property.